Trinity Designs: Happy St. Patty's Day! And I have a Pot of Gold Special Offer for you too! Today ONLY - place a minimum $50 merchandise order from my website at www.robinstamps4u.stampinup.net and not only will you automatically receive a Sale-A-Bration item of your choice FREE, I will mail you your choice of either a package of Gold Brads, or a jar of Gold Embossing Powder - FREE! To qualify, orders must be placed by midnight tonight! Just click the "Shop Now" button from the home page of my website link above. The card base is Glorious Green, layered with Basic Black then a piece of the Sale-A-Bration Delicate Dots paper (FREE!). The Glorious Green strip is punched with the new Eyelet Border punch and then layered up with some Black Gingham ribbon. 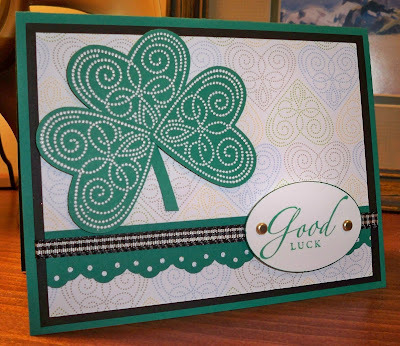 I used the "Good Luck" greeting from the Sincere Salutations stamp set - an oldie, but a goodie! This was stamped on Whisper White with Glorious Green then edged with the matching Stampin' Write Marker. I added two Gold Brads and popped it up on two Stampin' Dimensionals. The shamrock is made by stamping 3 of the heart images from the Sale-A-Bration stamp set Polka Dot Punches with Whisper White Craft ink. I then embossed them with Whisper White embossing powder and my Heat Tool. They were punched out with the New Full Heart punch and popped up on Stampin' Dimensionals and adhered to the front of the card. A hand cut stem completes the shamrock and now you are done! I hope you like it and I hope you all have a fun, safe St. Patrick's Day celebration!